As hot and sunny as it looks, I promise you that it is. I think I even started to perspire today. Ha! I decided to do a quick outfit post today. I was running errands and this is what I did it in. I don't have a whole lot to fill you in on. I've really been working more than anything else. Since I picked up more writing gigs it kind of leaves me behind the computer instead of out and about. I promise you guys that the days that I am at home writing, I'm in yoga pants just like everyone else. LOL. Style Notes: I purchased the skirt from a online resale shop so there was only one, but I'm sure you could request it from JIBRI yourself. Flare skirts are my favorite thing to spend the summer in. 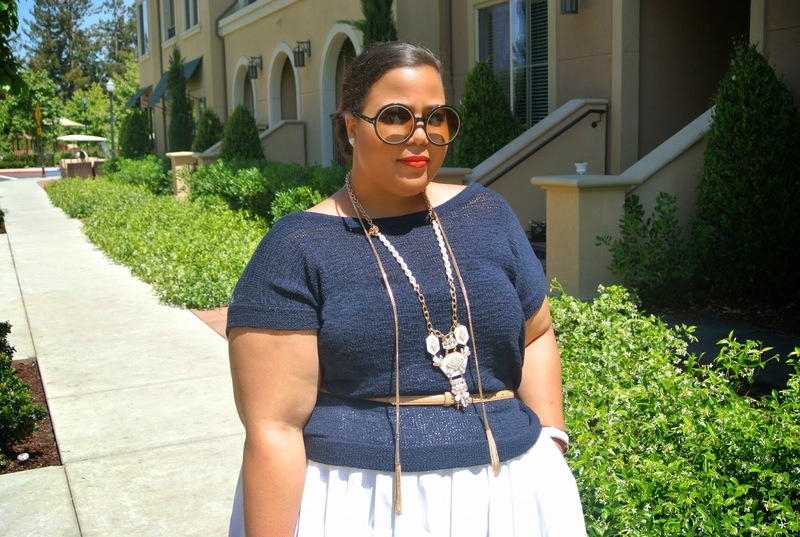 You may want to note that this sweater-ish top from Eloquii is sort of sheer. 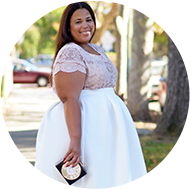 I had my super bra on (the butterfly bra from Ashley Stewart) so that pretty much covers just as much as a tube crop top, but you may want to add a camisole underneath for coverage. Where's the purse from? Love it..you go girl..
LOVE THIS AND U! 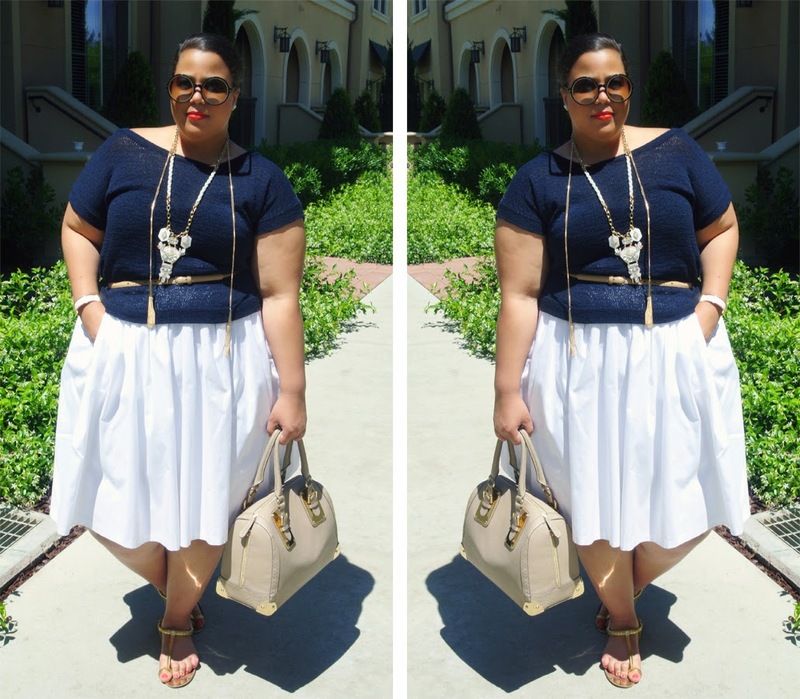 I THINK I WANNA BE A PLUS SIZE BLOGGER! ANY TIPS ON HOW TO GET STARTED? Hi love your style. That shirt you have on does it run true to size? Or does it run small or large? Go by the size chart. You should measure your waist and compare to the size chart. There's no stretch so whatever the waist circumference is for that that particular size then that's what the skirt will be. I generally take a 2 which I think is like 40 inches. This looks very light and airy and comfy for one who sweats a bit (ahem, me lol). I also like the detail on the back of this top (checked the site). Favorite blogger, you did it again!!! P.S. I love the pop of color on the lips! Love the Butterfly Bra--just wished it came in my size. I wrote to their Customer Service about it--seems they've had many request to make it larger in the band and the cup. I hear it's a well fitting bra. Like you should have. It's a shame they don't carry larger sizes in such a fantastic strapless bra. I love this look. And that skirt! So perfect for spring/summer. Yeah and congrats on your new journey!!!!! Simple yet stylish! I adore the accessories you chose! Hi,Ciao Chastity...you're always so stylish!...this Navy & White outfit is so charming on you...so Great! Love that skirt. I've been on the hunt for a white skirt. As usual, you're looking fancy huh! A little off topic, but you mentioned yoga pants...I'm pregnant and am not looking forward to shopping maternity plus sizes (I've heard there is not much out there). Was just wondering what yoga pants you use? The yoga pants I have came from Target. Honestly if you are looking for maternity wear I would just plus size clothes bigger and buy one or two pair of maternity bottoms. That's what other people I know did. Thanks! I will have to go that route.